‘I tricycled over to Peers Court, Stinchcomb and lunched with the Brooke-Hunts, 16 1/2 miles; then on to Hempstead, to a garden party and home by Gloucester, 36 miles in all. I rode Clara’s tricycle and sustained a flying fall in going down a sudden pitch. I was not hurt and enjoyed my day immensely.’ This is from the sometimes amusing and colourful diaries of John Dearman Birchall, a cloth merchant who retired to Gloucester to live the good life as a squire, and who died 120 years ago today. Apart from tricycle expeditions, his diaries, which were edited alongside those of his wife’s by their grandson, tell of farming, fishing, flower shows and garden parties, as well as his work as a magistrate and wider political events. Birchall was born in Leeds in 1828 into a family of wealthy Quaker merchants. His mother died when he was nine, and an older sister, Eliza, gave him religious instruction and was his closest friend. He was educated at small private schools in York and Croydon. As a young man, he joined a Leeds firm of cloth merchants, and then, in 1853, aged 25, he started his own company. In 1861, he married Clara Jane Brook, having left the Quakers and being baptised into the Church of England. Their daughter, Clara Sophia, was born the following year; but soon after Clara Jane died of consumption, aged but 21. Birchall’s firm went on to win prizes for its cloth at international exhibitions as far afield as the United States and Australia. In the late 1860s, though, he bought a small estate near Gloucester, Bowden Hall, thus becoming a squire. 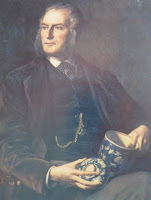 There he was able to indulge his cultured passions, notably art (he was an occasional patron of the Pre-Raphaelites) and blue-and-white porcelain. However, now some distance from his company, he became less involved in its day-to-day business matters, though he retained the biggest share holding for another two decades. In 1873, he married Emily Jowitt who was only 20, and they had five children. In time, Birchall became a magistrate, an alderman, and ultimately High Sheriff of Gloucestershire. Emily, like Eliza, died tragically young, in 1884. He himself died on 11 June 1897. There is very little information about Birchall online other than basic details at Geni.com or Geneagraphie. However, because Dearman and Emily both kept diaries, a good deal more about their life became available in 1983 when Alan Sutton (eventually taken over by The History Press) published The Diary of a Victorian Squire, Extracts from the Diaries and Letters of Dearman & Emily Birchall. The book was edited and put together by David Verey, Birchall’s grandson. A couple of reviews can be found online, at History Today and John Edwards blog. Here are several extracts from Dearman Birchall’s diary as found in Verey’s book.